Norway, the country with one of the world’s largest pension funds, actually ranks low in terms of pension income that workers in the private sector can expect when they retire. Pension reform in Norway has left many employees with pensions that will equal less than half their income upon retirement. Newspaper Dagens Næringsliv (DN) reported Tuesday on the results of a study conducted by consulting company Mercer. Its latest figures show that an average Norwegian worker can only expect 48.8 percent of their annual pay when they retire. 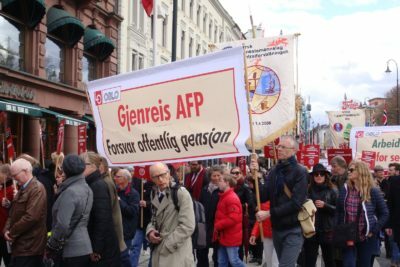 Public-sector pensions, strong unions that have helped ensure better pensions for organized labour, and lucrative pension agreements among highly paid executives boost Norway’s ranking on the Melbourne Mercer Global Pension Index, putting overall pension pay at 71.5 percent of so-called sluttlønn (final pay upon retirement). That compares to 80.3 percent in the Netherlands, though, and it also ranks behind Denmark, Finland, Australia and Sweden. Norway’s sixth-place on the list is down from fourth place last year, according to DN. It’s those working in the private sector, and especially those working for companies that haven’t made pensions a major benefit, who drag down the average Norwegian worker’s pension prospects. That’s because private sector employers in Norway aren’t obliged to contribute more than 2 percent of their employees’ annual income in a pension savings program. While many companies set aside 5 percent, that still won’t necessarily amount to much when retirement age rolls around. “I don’t think most folks have understood this, and I think it’s a challenge that not enough people are interested,” Per Myklestu, chief executive of Mercer Norge, told DN. Retirement age often seems far off in the future, and not something worth worrying about when workers are more concerned about paying the mortgage and other current bills. It’s a paradox, though, that many Norwegians living in one of the world’s wealthiest countries are likely to be met with an unhappy surprise when they retire. “Other countries that we like to compare ourselves with have pensions with a considerably higher portion (of final pay).” Myklestu told DN. Denmark, for example, also has a public pension system similar to Norway’s system (called folketrygden). Pensions earned through Danish employers, however, are normally much higher than those offered by Norwegian employers, leaving Denmark in second place on Mercer’s index and pension pay amounting to 80.2 percent of final pay. Tor Sydnes, a pension fund manager and adviser at Norwegian consulting firm Gabler, considers the Mercer survey well-regarded. “The numbers they use, showing that the average Norwegian can expect somewhere around 49 percent of final pay in pension, seem reasonable,” Sydnes told DN. He agreed that many Norwegians are and will be surprised by the numbers. They can be linked to the pension reform agreed to in 2011, during the last Labour Party-led government. Concerns were high at the time that increased life expectancy and rising salaries would make pension obligations too expensive and unpredictable for both public- and private-sector employers. Many employees were subsequently forced out of pension plans that guaranteed around 66 percent of final pay for life, called an ytelsespensjon, and put into plans where employers only contributed a fixed amount of an employee’s income every year, called an innskuddspensjon. The employee also has been given much of the responsibility and risk over how the money is invested, but can take the full amount of the pension fund with him or her when changing jobs.